If it's wildflowers that you’re after, the Frisco to Vail thru-hike is a sure bet. The hike is made up of two connecting trails—Meadow Creek and Gore Creek—that wind lazily through forest and alpine terrain. But it's the wildflower displays in the Eagles Nest Wilderness Area that make this hike unforgettable. For a slightly shortened hike with similar wildflower wonders, try 10.25-mile Eccles Pass within Eagles Nest. Click here for a detailed trail description. Two 14ers in one day says it all—this is a tough but rewarding route that a committed hiker can tackle in a single, epic day. That's all thanks to a short, connecting strip between Grays and Torreys peaks, the two highest points on the Continental Divide. Along the way, you're treated to unobstructed views of several glaciers, set against the standard jaw-dropping backdrop of the seemingly endless Rockies. The 12,162-foot peak of St. Vrain Mountain straddles the southern border of Rocky Mountain National Park, but is accessed from outside of it. That means it has all of (and maybe even a little more than) the park's beauty with only a fraction of its crowds. What's more, the trail stays wide-open and high above the treeline for much of its course, offering some of the most expansive views of the park to be found anywhere. Speaking of views above the timberline, this loop is a highlight tour of Continental Divide scenery—climbing steep switchbacks from deep evergreen forests to exposed viewpoints where hikers get sweeping views of the surrounding mountains and alpine lakes. Crested Butte and Aspen are perhaps two of Colorado’s best-known mountain towns, and for good reason. Both towns inhabit one of the the Rockies' most gorgeous wildernesses in the Maroon Bells. Get an up close and personal view by hiking between the two along the West Maroon Creek Trail, which passes by Maroon and Crater Lakes, and traverses rocky terrain, narrow valleys and colorful wildflower meadows. 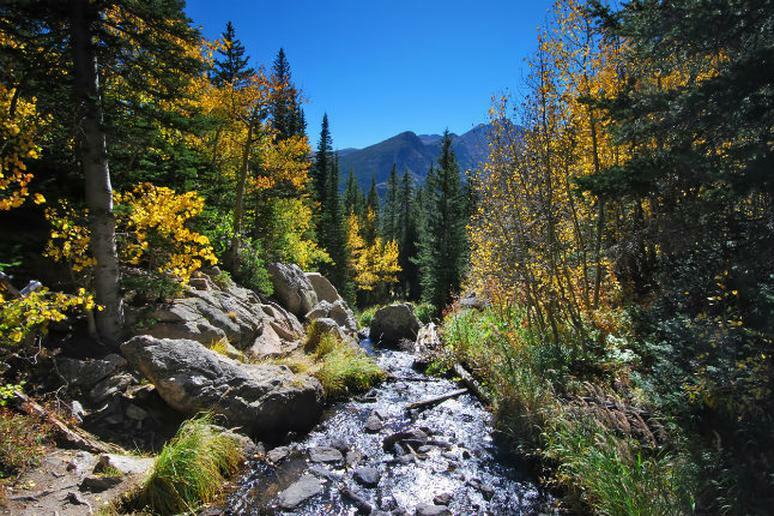 Since hiking the West Maroon means spending time in the two charming towns, it's popular to hike the trail in both directions on successive days, spending a night in town in between (we recommend staying in Aspen, where you can sip tasty beers at Aspen Brewing Company). This aptly named loop takes in five of Rocky Mountain National Park’s prettiest lakes—Bear, Helene, Odessa, Fern and Cub—in one swing. Since it lies entirely within the park's boundaries, the trail is carefully maintained, and conditions are usually close to perfect during the summer. The trailhead, which begins at Bear Lake, also offers a nice selection of brief, family-friendly day hikes around the lake. Flattop is one of those "more for less" trails, where you get stunning Glacier Gorge views without having to elbow your way up the über-popular (even crowded at times) Gorge itself. At the timberline, krummholz (German for "twisted wood")—interestingly twisted, stunted trees—mark the transition from subalpine forests to the alpine tundra near the peak, as well as the point where half-committed hikers are likely to turn back. This trail not only leads to one of the most isolated wild lakes in the state, it also climbs beneath one of the most iconic mountains, Longs Peak. This hike kicks off from the Longs Peak Trailhead, before splitting off toward Chasm Lake. There's plenty of exposure along the route, offering unique vantage points of the mighty mountain where, if you look closely, you might see more ambitious hikers and climbers summiting thousands of feet above you on a clear day. This moderate hike is packed with high mountain wilderness beauty, but isn't so demanding as some of the others. Characterized by rolling, evergreen- and aspen-speckled terrain, Mountain Lion Loop offers a balanced Rocky Mountain experience that includes, around midhike, the chance to summit 9,106-foot Windy Peak. The Bitterbrush and Nelson trails—set amid the salmon-red mesas and open meadows of the Hall Ranch formation east of the Rockies—offer an awesome alternative to more traditional hiking spots that are higher up in the mountains. Hiking this wildlife-rich route is a nice option for people who haven't completely adapted to the Rockie's high altitudes, since the area offers excellent views of the Front Range while tipping just a touch higher in elevation than the not-so-far-off Denver metro area. The Pawnee National Grasslands represent one of Colorado's most surreal and transformative landscapes—with intricately carved buttes, gullies, mesas and escarpments carved out of the verdant (and nearly pancake-flat) grassland prairies. This easy hike winds four miles across this alien landscape, connecting West Pawnee and East Pawnee buttes, which should be enjoyed from afar, but never climbed. For more on Colorado’s numerous hiking trails, visit ProTrails.com’s Colorado page.